Do you ever wonder how to save money on family vacations? Saving money is definitely important, but so are trips. Like many of you, we believe in giving our kids experiences over “stuff.” Science shows that we should spend our money on vacations instead of toys. There are infinitely more memories to be made from a family vacation than from the latest plastic toy. That being said, vacations can be expensive — especially for large families. 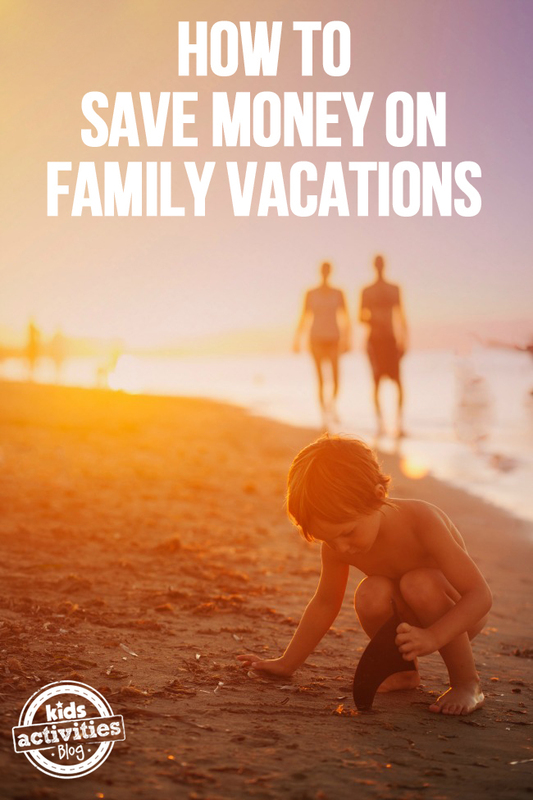 I thought I’d share with you some of the ways that we save money on family vacations and how it’s helped us take more trips over the last few years. Some of the ideas might work for your family and some may not, but any money saved is better than money spent! Summer is usually the most popular time of year for vacation destinations. The weather is warmer, there are more activities planned, and there are inevitably more people vying for the same hotel rooms. Since we’re a large family and sometimes need multiple rooms, saving on hotel fees is paramount. We’ve discovered that going on vacation in the fall or spring, before or after the high-season, results in cheaper hotel rooms and better deals. It can definitely be tricky with school and work schedules, but if you can vacation at a non-peak time, you’ll find that you’ll save quite a bit of money. I’m a planner (with four kids you need to be! ), so planning and researching our vacations is my thing. By starting months in advance of when we’d like to go, I can often find discounted tickets for amusement parks, museums, and other areas of interest. While I try not to micro-manage the vacation by planning it down to the minute, we do have a loose schedule of when we’ll be going where and which day is our “hotel pool” day! I’ve found that planning our days also helps with planning out meals too – another vacation expense that can quickly add up! Speaking of meals, whenever possible, we opt for hotel rooms with a mini-fridge and microwave. It makes it easy to bring breakfast foods, yogurt, snacks, and the always needed bottled water. If you do go out and have leftovers, the mini-fridge is perfect for storing them for the next meal. If the hotel has a free breakfast, even better! You’ll find that eating in can save you a ton of money – especially if you have a large family! Did you know that AAA members can get a discount on hotel rooms and some amusement parks? Many other organizations and groups offer discounted tickets, hotel prices, and more. Check with the hotel’s website (or call the hotel directly!) to see what specials they offer. When it comes to discounts and family vacations, take advantage of as many as possible. It will free up funds to do more while you’re away! It used to be that flying was the quickest, cheapest way to get around the country, but these days, airfares have skyrocketed and the hassle of flying may not be worth it. If you live close enough to drive to your vacation destination and you don’t mind doing so, add up the cost of gas, any needed hotel rooms for overnight stops, and snacks along the way. You may find that driving is significantly less expensive than flying a family of five or six! If driving isn’t your thing, consider taking the train instead. However, if flying is the preferred or only option, make sure you do plenty of price comparisons (in private browsing mode!) and use any frequent flier miles that you’ve saved up to help cut down on the costs. If you can’t afford huge family vacations, don’t worry! Your children will still enjoy stay-cations or mini-trips to local areas of interest. It isn’t necessarily the destination that sticks in their mind for years to come – it’s the memories they make when you’re all together.